Margins are razor-thin in the food industry. So when a bacteria outbreak like E. coli hits, it can really wreak havoc throughout the entire supply chain. That’s how Frank Yiannas, vice president of food safety at Walmart, described it to The Wall Street Journal. He’s being coy. It’s a revolution. And investors should take note. Under Walmart’s leadership, Nestlé SA, Dole Food Co., Driscoll’s, Golden State Foods, Kroger Co., McCormick, McLane Co., Tyson Foods, and Unilever, are attempting to do something that has never been done before. These food industry giants want to create a food trust. They want track food from the farm to the grocery aisle. If something goes wrong, they will know exactly where it began, and why. That type of transparency would forever change the food supply chain. It would keep suppliers on their toes. One wrong move could kill years of goodwill. It would also give distributors and processors unprecedented control. o make this possible, the food companies will use blockchain. The distributed digital ledger, best known for its role in keeping cryptocurrencies in check, will do the same for the food supply chain. It will create an electronic verification network in real-time for every single food product in the trust. Blockchain is uniquely suited for this task. That’s because its ledger system is permanent and can’t be altered. Every time a verified event occurs, a block is created on the chain. And it is viewable by all. That makes the system inherently “trustless,” which in this context means it does not require trust. In 2017, the Financial Times reported six of the world’s largest banks — Barclays, Credit Suisse, CIBC, HSBC, MUFG and State Street — announced support for the Utility Settlement Coin (USC). That’s a blockchain created by UBS, the Swiss banking giant. This USC system is supposed to let banks conduct transactions without waiting for traditional money transfers. In January 2018, Maersk, the container ship conglomerate, announced a blockchain for transoceanic logistics. The Danish company hopes this open-source, digital platform will become the standard for a $4 trillion shipping industry that’s currently drowning in bureaucratic red tape and piracy. International Business Machines is winning the public relations war. It’s behind the Maersk and food trust blockchains. My research suggests they should focus on Microsoft. Unlike IBM, the Redmond, Wash., software giant has the cloud computing scale to be a dominant player in blockchain. It also has a history of solving big, real world problems with the technology. In 2015, the company shifted its business model from selling software licenses to digital subscriptions. The distinction created a flood of partners looking to sell cloud services on Azure, its cloud network. Microsoft needed a system to quickly assess creditworthiness. The traditional process involved working with individual banks to issue standby letters of credit for the new sellers. But the process was antiquated, and involved several levels of manual verification. So Microsoft worked with Bank of America to digitize and automate the entire process with blockchain. It partnered with ConsenSys, a New York blockchain software company, to bring the Ethereum blockchain to Azure, as a Software-as-a Service layer. Microsoft leveraged this modularity to win over R3, a consortium of 200 financial institutions. Together, they are developing Corda, a blockchain specifically built to reduce transaction friction in financial services. In 2017, Bain & Co., a research and analytics firm, estimated $35 billion in operating and capital cost savings for a blockchain of this scale. For Microsoft, Corda is the gateway. The prize is untold billions in sales of cloud computing services. It is a big business for Microsoft. In the first quarter of fiscal 2018, Azure commercial cloud revenue jumped 58% to $6 billion. As businesses move to the cloud, having a blockchain software module is a huge advantage. The prospects are being reflected in the price. Since 2015, shares have risen an average of 31% annually. And the real growth lies ahead as more companies embrace the cloud and SaaS applications. FedEx-like tracking for everything is coming. Buy Microsoft shares into any pullback. That’s the view held by several China-based venture capitalists and research firms. Speaking on the sidelines of Forbes Asia’s Under 30 Summit in Hong Kong, a number of young investors and honorees from this year’s list say valuations for private companies in China will return to “more reasonable” levels in the second half of this year. They said “bubble-like” valuation levels had become prevalent in China’s private investment space, as investors poured a staggering 1.2 trillion yuan ($180 billion)— or 1.5% of the country’s gross domestic product— to fund private firms in 2017, according to Beijing-based research firm Zero2IPO. But those days appear to be coming to an end. As Beijing seeks to contain financial risks in the world’s second-largest economy, venture capitalists are having a much more difficult time raising money. This is mainly because authorities are clamping down on riskier investments made by Chinese banks, announcing in April a set of far-reaching rules on their wealth-management businesses. Proceeds raised through such channels have historically accounted for a sizable part of venture capital funding in China, as they were often later used to invest in private companies for higher returns. This can also lead to significant risks as the success of early stage firms is by no means guaranteed. According to Zero2IPO, in the first three months of this year, venture capital and private equity firms in China raised 206 billion yuan ($31 billion), a 30% decrease from the same period last year. In a recent website post, Wang Ran, chief executive of Beijing-based investment firm CEC Capital, predicted that venture capital funding in China could fall by as much as 80% by year end. For private startups, this means valuation levels would be reduced by 30%, as there would be less money to support their growth, according to the post. One area that has been singled out for criticism is the so-called sharing economy. 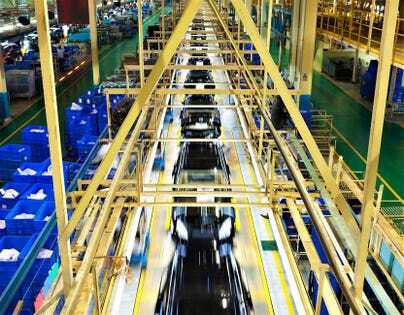 In a recent editorial, the state-run Xinhua News Agency said there is a “bubble” in this sector, with companies rushing to launch various product-sharing schemes that don’t have a viable path to profitability. It cited the example of home-sharing startup Zhubaijia, which is similar to Airbnb, but has been suffering from mounting losses that totaled 87 million yuan ($13 million) in 2016 due to fierce competition and high operating costs. In early July, regulators de-listed Zhubaijia from China’s third stock exchange because it failed to file its 2017 annual report on time. And some of China’s better-known sharing-economy companies are scaling down their operations. After expanding into a dozen global cities in the past two years, Beijing-based bike-sharing startup Ofo laid off the majority of its workforce in the U.S. to re-focus on China. Meanwhile, its biggest rival, Mobike, was acquired in April for $2.7 billion by China’s largest online services platform Meituan. And Guangzhou Yueqi, a smaller player that operates the Xiaoming Bike brand, went bankrupt last year amid fierce competition that has pushed prices down to less than 1 yuan ($0.16) per hour in China. The company has more than 55 million yuan ($8.2 million) in outstanding debt after deploying more than 400,000 bikes across the country since 2016, according to Xinhua. Meanwhile, as it gets harder to raise money from private investors, a record number of Chinese tech firms are tapping public markets. So far, several dozen Chinese tech firms, including Meituan and the three-year-old e-commerce startup Pinduoduo, have opted for initial public offerings. But the hotly anticipated IPO of smartphone maker Xiaomi valued the company at only about half of its initially proposed target of $100 billion, signaling that the capital markets may not support the lofty valuations set during earlier fundraising rounds for these tech companies. But this is not to say that China’s startup boom is over. According to CB Insights, the country was home to 55 unicorns, or private companies with a valuation of $1 billion or more, as of September 2017— a number second only to the U.S. And Ant Financial, the payment affiliate of e-commerce giant Alibaba, took over ride-sharing firm Uber as the world’s highest valued private startup after completing a $14 billion mega-funding round in June. Moreover, investors seem to be especially optimistic of blockchain technology, the digital ledgers that underpin digital coin transactions. Although Beijing banned initial coin offerings last year to curb illegal fundraising activities, this technology of secured and decentralized data storage still holds a great deal of promises in China. It can be used in industries such as finance and real estate to facilitate faster and more efficient tracking of data and contracts, thereby improving efficiency. Investors are already making early bets now, predicting that blockchain will give birth to China’s next tech behemoth. Capitalizing on new digital business models and the growth opportunities they provide are forcing companies to re-evaluate ERP’s role. Made inflexible by years of customization, legacy ERP systems aren’t delivering what digital business models need today to scale and grow. Legacy ERP systems were purpose-built to excel at production consistency first at the expense of flexibility and responsiveness to customers’ changing requirements. By taking a business case-based approach to integrating Artificial Intelligence (AI) and machine learning into their platforms, Cloud ERP providers can fill the gap legacy ERP systems can’t. Companies need to be able to respond quickly to unexpected, unfamiliar and unforeseen dilemmas with smart decisions fast for new digital business models to succeed. That’s not possible today with legacy ERP systems. Legacy IT technology stacks and the ERP systems they are built on aren’t designed to deliver the data needed most. That’s all changing fast. A clear, compelling business model and successful execution of its related strategies are what all successful Cloud ERP implementations share. Cloud ERP platforms and apps provide organizations the flexibility they need to prioritize growth plans over IT constraints. And many have taken an Application Programming Interface (API) approach to integrate with legacy ERP systems to gain the incremental data these systems provide. In today’s era of Cloud ERP, rip-and-replace isn’t as commonplace as reorganizing entire IT architectures for greater speed, scale, and customer transparency using cloud-first platforms. New business models thrive when an ERP system is constantly learning. That’s one of the greatest gaps between what Cloud ERP platforms’ potential and where their legacy counterparts are today. Cloud platforms provide greater integration options and more flexibility to customize applications and improve usability which is one of the biggest drawbacks of legacy ERP systems. Designed to deliver results by providing AI- and machine learning insights, Cloud ERP platforms, and apps can rejuvenate ERP systems and their contributions to business growth. Cloud ERP platforms need to create and strengthen a self-learning knowledge system that orchestrates AI and machine learning from the shop floor to the top floor and across supplier networks. Having a cloud-based infrastructure that integrates core ERP Web Services, apps, and real-time monitoring to deliver a steady stream of data to AI and machine learning algorithms accelerates how quickly the entire system learns. The Cloud ERP platform integration roadmap needs to include APIs and Web Services to connect with the many suppliers and buyer systems outside the walls of a manufacturer while integrating with legacy ERP systems to aggregate and analyze the decades of data they have generated. Virtual agents have the potential to redefine many areas of manufacturing operations, from pick-by-voice systems to advanced diagnostics. Apple’s Siri, Amazon’s Alexa, Google Voice, and Microsoft Cortana have the potential to be modified to streamline operations tasks and processes, bringing contextual guidance and direction to complex tasks. An example of one task virtual agents are being used for today is guiding production workers to select from the correct product bin as required by the Bill of Materials. Machinery manufacturers are piloting voice agents that can provide detailed work instructions that streamline configure-to-order and engineer-to-order production. 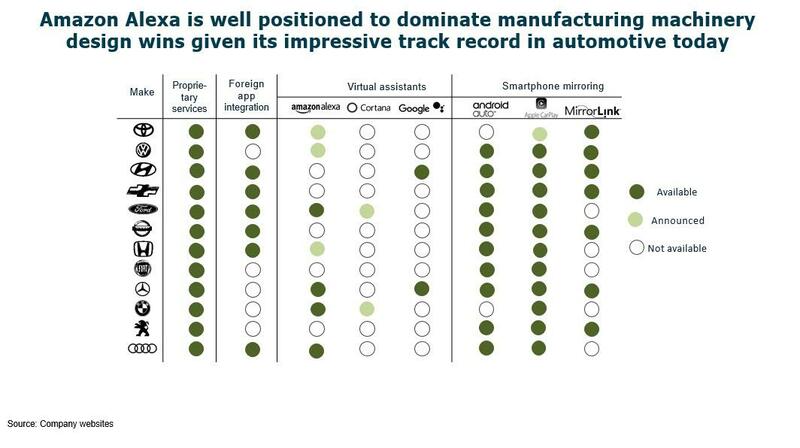 Amazon has successfully partnered with automotive manufacturers and has the most design wins as of today. They could easily replicate this success with machinery manufacturers. Design in the Internet of Things (IoT) support at the data structure level to realize quick wins as data collection pilots go live and scale. Cloud ERP platforms have the potential to capitalize on the massive data stream IoT devices are generating today by designing in support at the data structure level first. Providing IoT-based data to AI and machine learning apps continually will bridge the intelligence gap many companies face today as they pursue new business models. 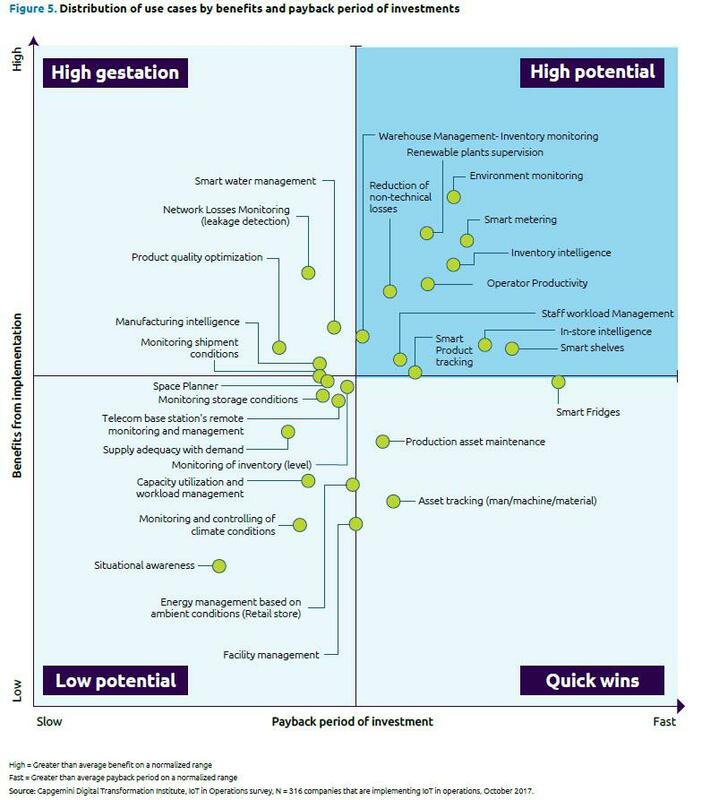 Capgemini has provided an analysis of IoT use cases shown below, highlighting how production asset maintenance and asset tracking are quick wins waiting to happen. Cloud ERP platforms can accelerate them by designing in IoT support. 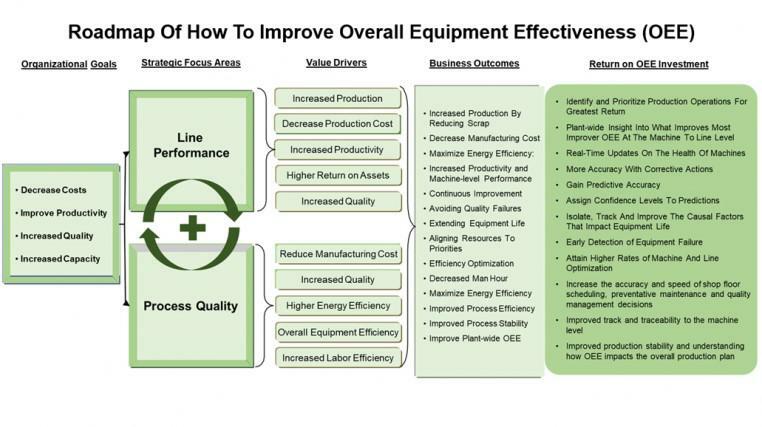 AI and machine learning can provide insights into how Overall Equipment Effectiveness (OEE) can be improved that aren’t apparent today. Manufacturers will welcome the opportunity to have greater insights into how they can stabilize then normalize OEE performance across their shop floors. When a Cloud ERP platform serves as an always-learning knowledge system, real-time monitoring data from machinery and production assets provide much-needed insights into areas for improvement and what’s going well on the shop floor. Designing machine learning algorithms into track-and-traceability to predict which lots from which suppliers are most likely to be of the highest or lowest quality. Machine learning algorithms excel at finding patterns in diverse data sets by continually applying constraint-based algorithms. Suppliers vary widely in their quality and delivery schedule performance levels. Using machine learning, it’s possible to create a track-and-trace application that could indicate which lot from which supplier is the riskiest and those that are of exceptional quality as well. Cloud ERP providers need to pay attention to how they can help close the configuration gap that exists between PLM, CAD, ERP and CRM systems by using AI and machine learning. The most successful product configuration strategies rely on a single, lifecycle-based view of product configurations. They’re able to alleviate the conflicts between how engineering designs a product with CAD and PLM, how sales & marketing sell it with CRM, and how manufacturing builds it with an ERP system. AI and machine learning can enable configuration lifecycle management and avert lost time and sales, streamlining CPQ and product configuration strategies in the process. Improving demand forecasting accuracy and enabling better collaboration with suppliers based on insights from machine learning-based predictive models is attainable with higher quality data. By creating a self-learning knowledge system, Cloud ERP providers can vastly improve data latency rates that lead to higher forecast accuracy. Factoring in sales, marketing, and promotional programs further fine-tunes forecast accuracy. Reducing equipment breakdowns and increasing asset utilization by analyzing machine-level data to determine when a given part needs to be replaced. It’s possible to capture a steady stream of data on each machine’s health level using sensors equipped with an IP address. Cloud ERP providers have a great opportunity to capture machine-level data and use machine learning techniques to find patterns in production performance by using a production floor’s entire data set. This is especially important in process industries where machinery breakdowns lead to lost sales. Oil refineries are using machine learning models comprise more than 1,000 variables related to material input, output and process perimeters including weather conditions to estimate equipment failures. 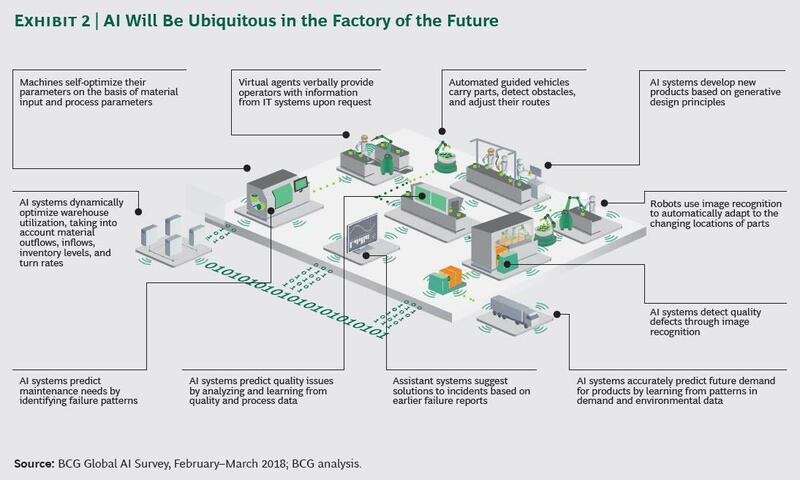 Implementing self-learning algorithms that use production incident reports to predict production problems on assembly lines needs to happen in Cloud ERP platforms. A local aircraft manufacturer is doing this today by using predictive modeling and machine learning to compare past incident reports. With legacy ERP systems these problems would have gone undetected and turned into production slowdowns or worse, the line having to stop. Improving product quality by having machine learning algorithms aggregate, analyze and continually learn from supplier inspection, quality control, Return Material Authorization (RMA) and product failure data. Cloud ERP platforms are in a unique position of being able to scale across the entire lifecycle of a product and capture quality data from the supplier to the customer. With legacy ERP systems manufacturers most often rely on an analysis of scrap materials by type or caused followed by RMAs. It’s time to get to the truth about why products fail, and machine learning can deliver the insights to get there. Over the last few weeks, many airlines have been crowing about how well they’re doing. And then there’s American Airlines. It suddenly encountered difficulties, despite being huge and enjoying an extended network in a buoyant economy. One of the areas in which it suffered is its Sub-Cattle Class. Often known as Basic Economy, these are the (allegedly) cheapest tickets that don’t let you change your seat, force you to board last, give you the worst seat at the last minute and, in American’s case, don’t let you use the overhead bins. I mentioned earlier this week that American had decided to change the carry-on requirements, as its Basic Economy offering wasn’t doing so well and was even angering its own employees. Gate Agents and Flight Attendants were forced into being the Bag Police, which is tiresome in the extreme. On the airline’s earnings call last week, American CEO Doug Parker offered another factor that contributed to the airline’s poor Basic Economy performance. “There are now filters on things like Google search that ask you if you want to bring a carry-on, and if you say yes, the American flights don’t show up nearly as high as they did before because it adds $20 to our fare,” he said. The truth can be a pesky beast. It can reveal that your Basic Economy fare only exists to make passengers despise it so much that they’re prepared to pay more for the Economy Class that used to cost less. Parker insisted there was “nothing wrong” with passengers learning the truth. “When you get yourself in a position in this business where price-sensitive customers find themselves with lower fares on truly competitive airlines like that, we have to take that into consideration,” he said. Many passengers may chuckle at the notion that American might not be a truly competitive airline. There’s another aspect to all this, however. The major airlines — American included — have, for quite some time now, been pressuring the government to stop Google and comparison sites like Kayak from revealing the true cost of flights. Or, rather, they want to force them to reveal the same information as the airlines do — such as flight delays — without actually having access to that information. The big airlines want customers to go to the airline’s own site, where they can be fooled into thinking that fares are very low, until they see — just before pressing the Buy button — just how much all the extras cost. So when Parker says there’s nothing wrong with customers accessing Google, I fear he may mean that there’s everything annoying about it. At Southwest Airlines, employees are encouraged to express themselves. To dance around in TV ads, for example. Here, then, was a Southwest flight that came upon a mysterious companion, flying parallel on its right. This happens often on certain routes. Sometimes, it’s fascinating to see how long the planes will continue to travel side by side. Sometimes, you might even wonder how close the other plane truly is. Ladies and gentlemen on the right side of the aircraft, look over to your right. You’ll see United. Wave to them so they get to see what a full aircraft looks like. Some passengers laughed, of course. And it’s an excellent example of how Southwest can boast a strong brand while United’s is, well, in transition. Some might think, though, that this wasn’t a gesture of solidarity toward the friendly skies. I asked United what it thought of this barb. Stunningly, the airline declined to comment. I also contacted Southwest to ask for its view. “Our Employees like to have fun with our Customers. This sounds like some friendly banter with a competitor and friend of the skies,” a Southwest spokeswoman told me. Friend of the skies. Ah, very good. There’s largely little competition between the big four airlines. Yes, they nibble at each other around the edges. They can even make barbs. While I, of course, applaud Southwest for its readiness to be quippy, there’s one rational element that niggles here. I’d much rather fly on an empty plane than a full one. Indeed, research has regularly shown that the biggest difference between an enjoyable Economy Class experience and a less enjoyable one is whether the seat next to you is empty. Then again, airlines have constructed things so cleverly these days that there seem very few empty seats anywhere. BEVERLY HILLS, Calif. (Reuters) – Alphabet Inc’s YouTube is creating scripted series and other original programing for international markets including France, Germany, Japan, Mexico and India to try to draw new customers to its paid subscription service, a senior executive said on Friday. The programing will come in the form of multiple genres such as music documentaries, reality series, talk shows and scripted series, Susanne Daniels, YouTube’s global head of original programing, said in an interview. It will be produced in local languages and subtitled or dubbed for other markets. Some of the programing will appear on YouTube Premium, the monthly subscription service formerly called YouTube Red. Other content will be available on YouTube’s free service with advertising. YouTube will be competing with companies including Netflix Inc and Amazon.com Inc that are investing in local language programing for online audiences around the world. There are no current plans for more original children’s programing, Daniels said. The YouTube Kids app serves that younger audience, she said, and the company does not believe children’s content will drive subscriptions to YouTube Premium at this time. If you’re tired of having to manually type messages when using LinkedIn, you’re in luck. The Microsoft-owned social networking service for workers said Thursday that LinkedIn would now let people record and send each other voice messages that are limited to 1 minute in length. LinkedIn senior product manager Zack Hendlin wrote in a blog post that the new voice messaging feature is now available via the LinkedIn iOS and Android app. People will be able to listen to LinkedIn voice messages via their smartphone or personal computer. To leave a voice message, people will need to tap the microphone icon that’s displayed their smartphone’s digital keyboard, like they are sending voice messages via their mobile phone’s text messaging service. Amazon had a spectacular second quarter by all measures. The firm’s per-share earnings of $5.07 were more than double analysts’ estimates of $2.49, and it had the highest quarterly profit in its history of $2.5 billion. By nearly every metric, Amazon met or exceeded expectations, and demonstrated the strength of its Amazon Web Services cloud division and revenue from its relatively new advertising service. Both offer higher profit margins than its more traditional consumer-products businesses. Following the disappointment Wednesday in Facebook’s stalling growth in users and engagement in key markets, which led to a nearly 20% drop in its stock price and over $100 billion in market cap, Amazon regained a small drop during trading hours to return to its previous day’s close in after-hours markets. After a sizable dip in March and April this year, seemingly related to U.S. president Donald Trump’s criticism of the firm, the company’s stock resumed an almost uninterrupted multi-year climb. The firm market cap is over $850 billion, less than $100 billion shy of high-flying Apple. Sales skyrocketed for Amazon year over year from $38 billion to $52.9 billion, with a 37% increase after subtracting a favorable impact from foreign-exchange rates in the latest quarter. This revenue increase missed analysts’ targets by half a billion dollars, but the earning per-share muted concerns. Cloud revenue jumped from $4.1 billion to $6.1 billion year over year, while its category for miscellaneous income, largely comprising advertising, went from $945 million to $2.2 billion. Amazon’s retail store revenue, mostly from Whole Foods, was $4.3 billion, income that didn’t exist in the year-ago quarter. An increase in the fee from $99 to $119 for Amazon Prime service—which includes free two-day shipping, streaming video programming, and other benefits—didn’t seem to affect its ability to attract renewals and new Prime members. Subscription revenue rose to $3.4 billion, a 57 percent increase over the year-ago quarter. Amazon faced criticism today from the ACLU over its Rekognition facial-recognition technology, with the civil-liberties firm saying the system identified 28 members of Congress as matching criminal mugshots. Amazon said the ACLU’s test didn’t replicate how its used in law-enforcement investigations, where the service narrows a data set rather than provides a firm match. (Reuters) – Advanced Micro Devices Inc (AMD.O) beat analysts’ estimates for quarterly profit and revenue on Wednesday, as a rare surge in demand for personal computers boosted sales of its processors as well as graphics chips used in computers and data centers. The company’s shares rose more than 7 percent in after-hours trading. The Santa Clara, California-based company’s shares have more than doubled in the past two years on continued demand for graphics chips used in computers, videogame consoles and a variety of other applications. AMD said sales in its graphics and computing business, which makes processors for servers and gaming consoles, rose 64 percent to $1.09 billion, primarily driven by its Ryzen desktop processors and Radeon graphics cards. But it declined 3 percent quarter-over-quarter primarily due to lower revenue from GPU products in the blockchain market. Net income was $116 million, or 11 cents per share, in the second quarter ended June 30, compared to a loss of $42 million, or 4 cents per share, a year earlier. Excluding items, the company earned 14 cents per share, beating analysts’ average estimate of a profit of 13 cents, according to Thomson Reuters I/B/E/S. The chipmaker’s revenue rose 53 percent to $1.76 billion, beating estimates of $1.72 billion. (Reuters) – Qualcomm Inc (QCOM.O), the world’s biggest maker of chips for mobile phones, said on Wednesday it would drop its bid to buy Dutch chipmaker NXP Semiconductors (NXPI.O) after failing to secure regulatory approval from China against a backdrop of widening trade tensions. Excluding items, Qualcomm earned 75 cents per share, beating analysts estimates of 71 cents. Revenue rose 4.2 percent to $5.60 billion, above estimates of $5.19 billion. Shares in the San Diego California-based firm rose 4.2 percent to $61.87 in trading after the bell. NXP Semiconductors shares fell 2 percent to $96.42. Qualcomm, which beat off a $117 billion hostile bid from Broadcom Inc (AVGO.O) in March, has announced cost cuts and changes to its long-term licensing agreement with Samsung Electronics Co Ltd (005930.KS) while seeking to use a lower-cost licensing model for the next generation of 5G mobile data networks. Revenue from its Qualcomm CDMA Technologies (QCT) unit, which includes its chip business, rose 1 percent to $4.09 billion. Revenue from its licensing business rose 25 percent to $1.47 billion. The administration also moved to ban U.S. companies from doing business with China’s ZTE Corp (000063.SZ), which hurt Qualcomm’s earnings because it supplies chips for ZTE’s mobile phones. The ban was later lifted, raising hopes the NXP deal would survive. Members of U.S. Congress have called for the ban to be reinstated.